Help safeguard the environment with our Recycler (TM)! Made from 75% recycled newspaper and 25% new paper, this ingenious writing instrument features a brass-colored ferrule and colored eraser. Easy to sharpen and splinter free they make great giveaways at teacher conferences. 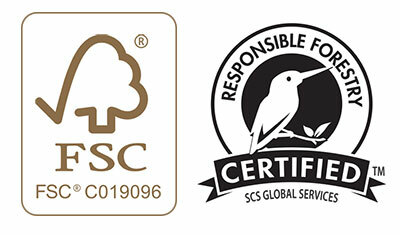 Conservation of our natural resources, along with newly recycled products are an integral part of our business philosophy - your welfare helps protect our welfare. Round barrel pencil, #2 core, made from 75% recycled newspaper and 25% new paper. Year Round Promotion. EQP or Pricing Discounts Do Not Apply. Looking for a promotional product that's got your name written all over it? Then you've come to the "write" place! Our bonded, #2 core International Pencil offers exceptional value at an exceptional price. This writing instrument features a round, wood-cased barrel with a brass-colored ferrule and a red eraser. Choose from the variety of colors, add your custom imprint and hand them out at your business or tradeshows! You've come to the "write" place if you're looking for a customizable pencil that's larger than life! The round barrel features an oversized design as does the medium soft bonded core that yields a heavy black mark and an extra-large diameter. With your company name or logo imprinted on the colorful backdrop you have a great giveaway for tradeshows; conventions and conferences. When you have a big job to do; call on the big value pencil! 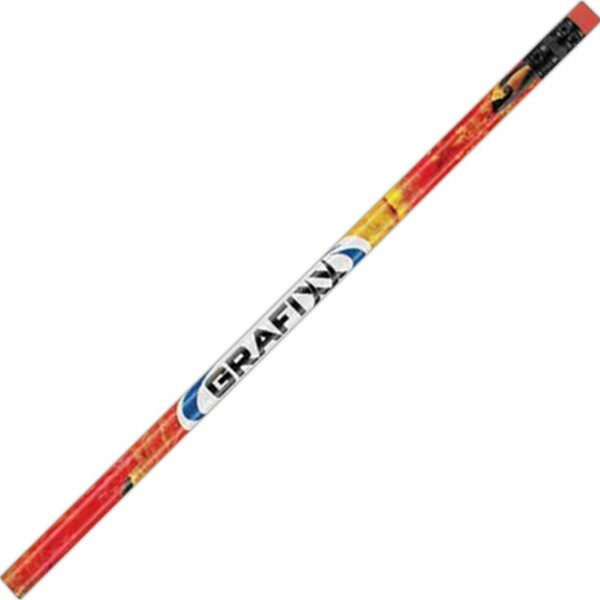 Un-tipped pencil with oversized soft bonded core, extra large 13/32" diameter. You've come to the "write" place if you're looking for a sharp promotional product for your next fundraiser or tradeshow. This striking graphite #2 core pencil is produced using a distinctive process that dyes the wood. When the Continental (TM) pencil is sharpened, the exposed taper is the same color as the outer casing. Features a black matte round wood barrel with black ferrule and matching black eraser. This pencil makes a statement before the writer does. Striking graphite #2 core pencil with wood dyed to match outer casing color. Our Black Matte (TM) pencils offer classic elegance at budget price. 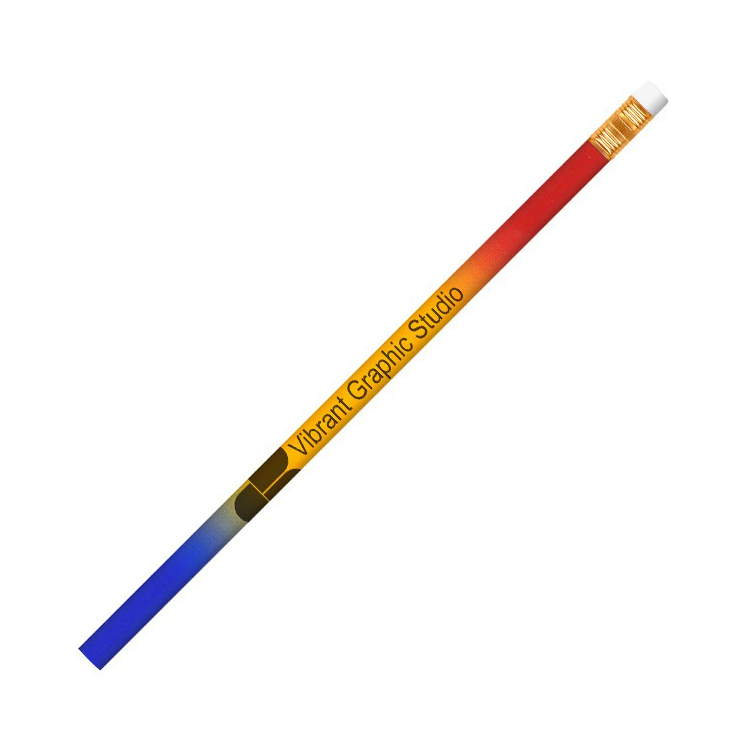 The #2 core pencil features a round barrel with black ferrule and 2 eraser color choices. Simply choose one that fits your mood, add your company name, message or logo and hand out the finished products at the next tradeshow you attend. Ideal for school events this stylized writing implement would also be perfect for charity fundraisers. Keep heading in the "write" direction! Round barrel #2 pencil with black ferrule and black or white eraser. Let the promotional success rain down when you add your company name, message or logo to the PAINT Pencil! This multi-colored writing instrument features a rounded barrel with a #2 bonded core, brass-colored ferrule and white eraser. The vibrant background promises dramatic, eye-catching advertising whether you own a retail shop, run a dance company or manage a local bank. You've certainly come to the "write" place! You've come to the "write" place if you're looking for a customizable pencil that's larger than life! The round barrel and soft; bonded core both feature an oversized design and an extra-large diameter plus a brass-colored ferrule and red eraser. With your company name or logo imprinted on the colorful backdrop you have a great giveaway for tradeshows; conventions and conferences. When you have a big job to do; call on the big value pencil! Tipped pencil with oversized soft bonded core, extra large 13/32" diameter. 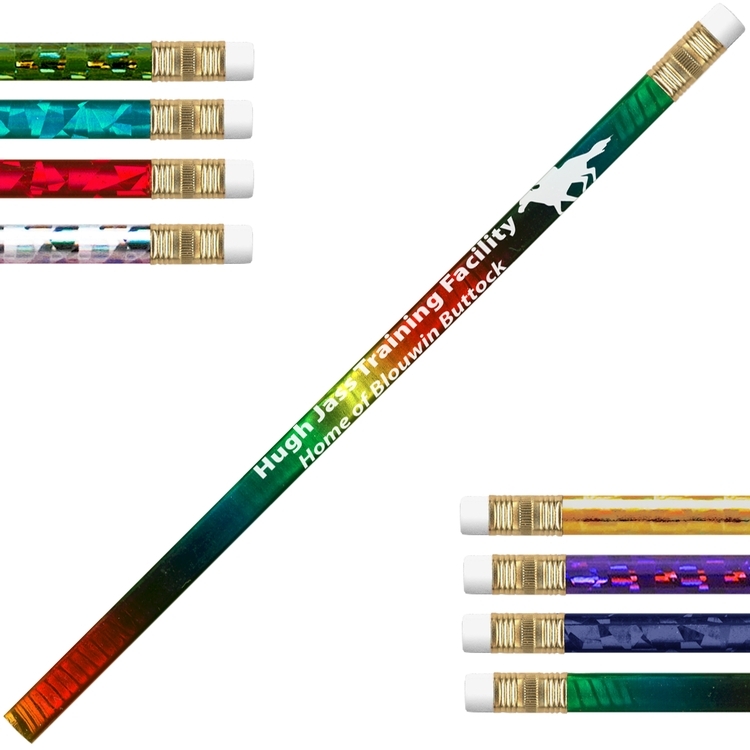 Let the promotional success rain down when you add your company name, message or logo to the True Rainbo (TM) Pencil! This multi-colored writing instrument features a rounded barrel with a #2 bonded core, brass-colored ferrule and white eraser. The vibrant background promises dramatic, eye-catching advertising whether you own a retail shop, run a dance company or manage a local bank. You've certainly come to the "write" place! Looking for a promotional product that's both convenient and versatile? Then you've come to the "write" place! 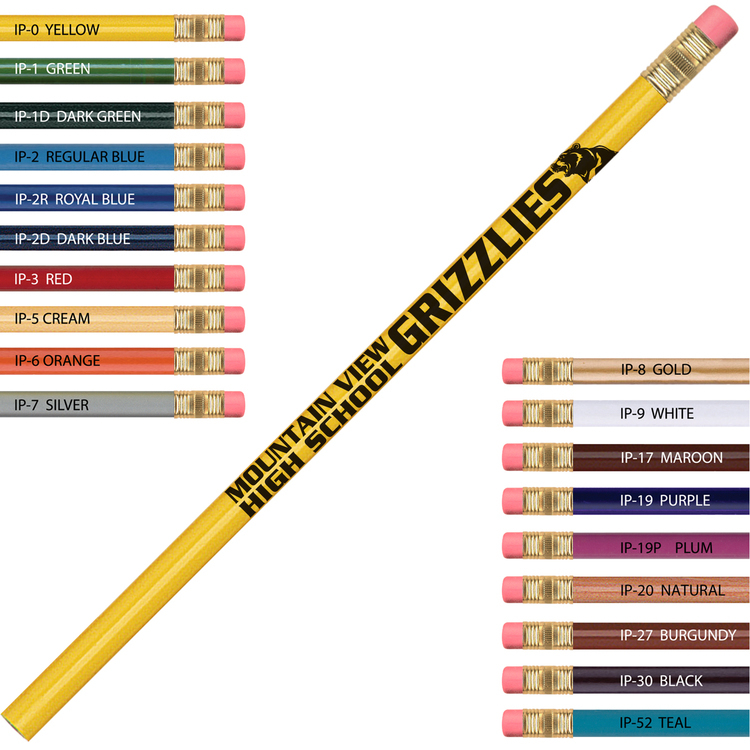 This un-tipped golf pencil features a #2 core with bonded lead and an economical size. 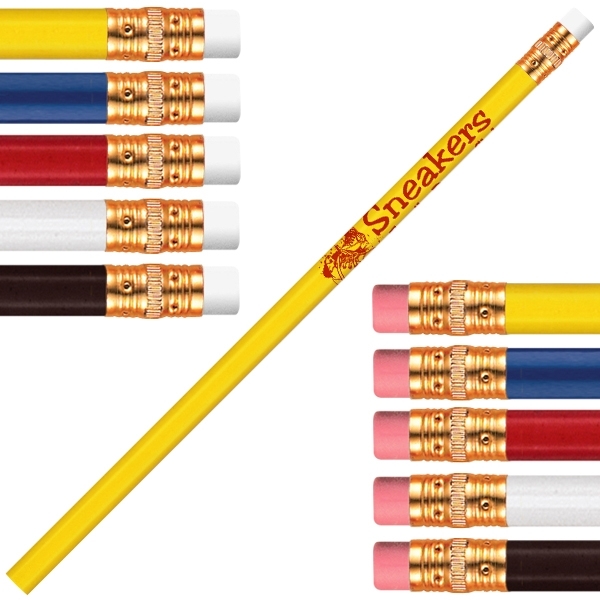 Perfect for golfing, pew use, putt-putt, outdoor play centers and boardwalks; these compact writing implements come is a wide variety of colors so that you can customize them according to your project needs! Golf pencil un-tipped with #2 core. The fun, contemporary designs of the Dynamic Duos (TM) blend the dramatic look of black and white with the dynamics of your ad message. Available in a variety of creative stock designs, the #2 core pencil features a round barrel with black ferrule and accenting eraser. Choose the pattern that works best for your event, add your company name, message or logo and hand them out at tradeshows. An instant impact sure to encourage a double take! Round barrel #2 core pencil with stock design. Make a vivid statement by adding your company name or logo onto these neon pencils! Featuring a round barrel and #2 core they offer quality throughout that's then topped with black ferrules and white erasers. The fun color options provide you with plenty of opportunities for customization according to your business or project needs. The finished designs would make excellent additions to party favor gift bags or tradeshow giveaways. Neon round barrel #2 core pencil with white eraser and black ferrule. Cash in on a great promotional product by adding your company name or logo to this classic writing instrument! Our CASH Pencil has a round barrel and white imprint area. 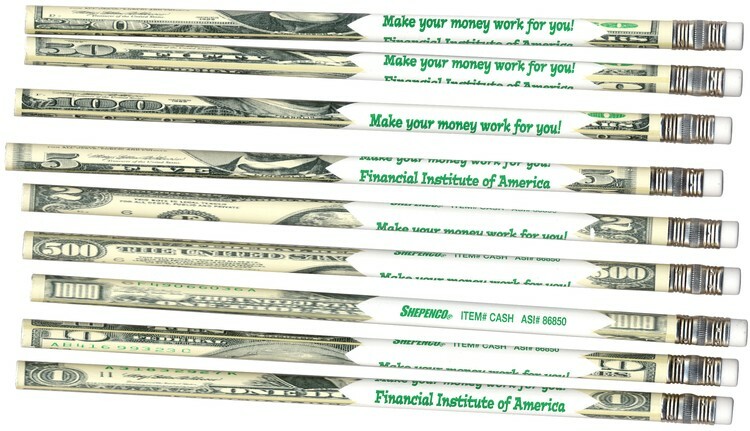 This #2 pencil comes in an assortment of US currency denomination replicas; making the finished designs ideal for financial institutions, classrooms and real estate agencies (includes $1, $2, $5, $10, $20, $50, $100 and $1000 images). Single denominations not available. Round barrel #2 core pencil in an assortment of US currency replica denominations. Make a vivid statement by adding your company name or logo onto these neon pencils! Featuring a round barrel and #2 core they offer quality throughout that's then topped with black ferrules and matching erasers. The fun color options provide you with plenty of opportunities for customization according to your business or project needs. The finished designs would make excellent additions to party favor gift bags or tradeshow giveaways. (Workhorse) Year Round Promotion. EQP or Pricing Discounts Do Not Apply. Have you been unable to find a promotional product that's "written" just for you? We offer you the opportunity to Create-A-Pencil (TM) from a broad array of barrel, ferrule and eraser colors. 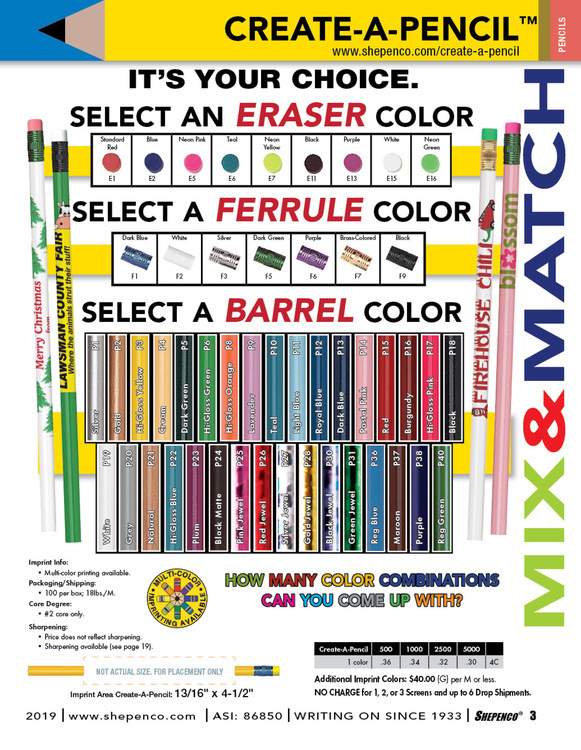 Start with a round barrel with a #2 core then have fun picking your ferrule and eraser colors. Maybe you have a charity fundraiser coming up or it could be election time. Go simplistic in design, or let your creative juices flow! The choice is yours. Customizable round barrel, #2 core pencil. Jumbo sized pencil with oversized medium soft core. Untipped. 25 lbs per 1000. Can we give you a "tip"? Our double-tipped pencil can truly drum up business. This unique desk accessory features a round white barrel with brass-colored ferrules and red erasers on both ends. This pencil is a great way to spark conversation. It would be fitting as a giveaway at the next tradeshow, convention or conference you attend. Add your company name or logo to help build brand awareness! Double-tipped round barrel pencil with ferrule and eraser on both ends. 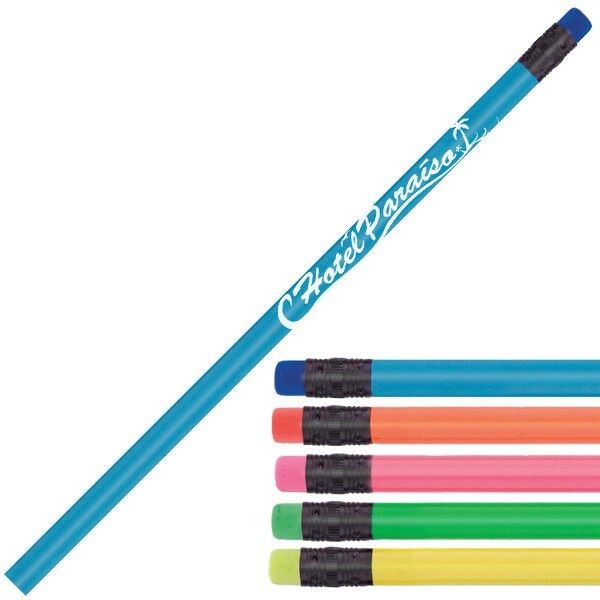 Make a vivid statement by adding your company name or logo on these Tropicolor(TM) pencils! Featuring a round barrel and #2 core they offer quality throughout topped with black ferrules and color coordinated erasers. The fun color options provide you with plenty of opportunities for customization according to your business or project needs. The finished designs would make excellent additions to party favor gift bags or tradeshow giveaways. Round barrel #2 core pencil with matching eraser and black ferrule. 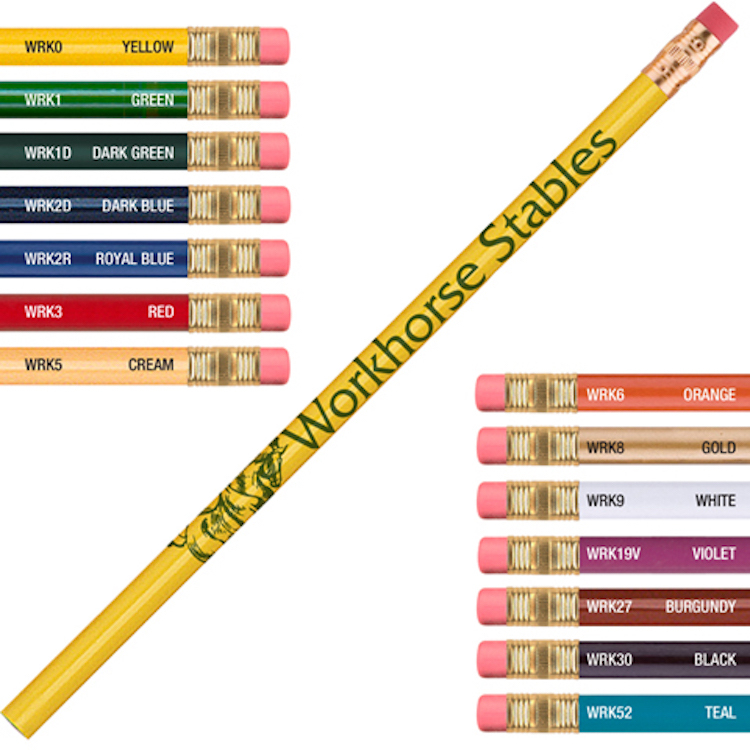 Our Shadow Special Value Workhorse pencils offer classic elegance at budget price. 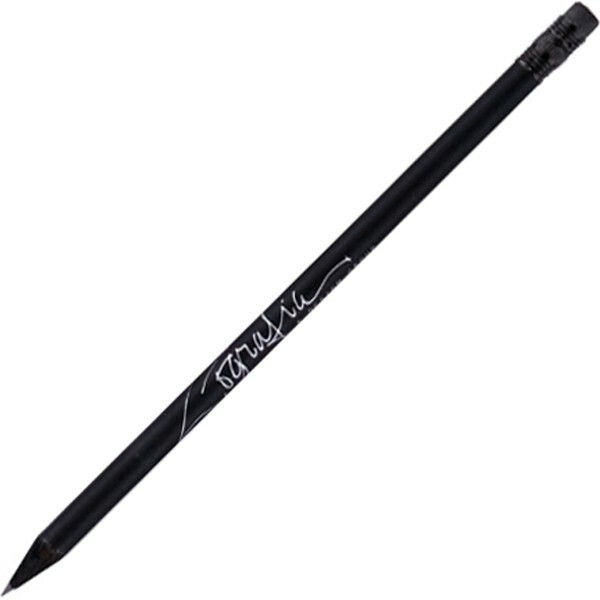 The #2 core pencil features a round black matte barrel with black ferrule and a black eraser. Simply add your company name, message or logo and hand out the finished products at the next tradeshow you attend. Ideal for school events this stylized writing implement would also be perfect for charity fundraisers. Keep heading in the "write" direction! Round black barrel #2 pencil with black ferrule and black eraser. 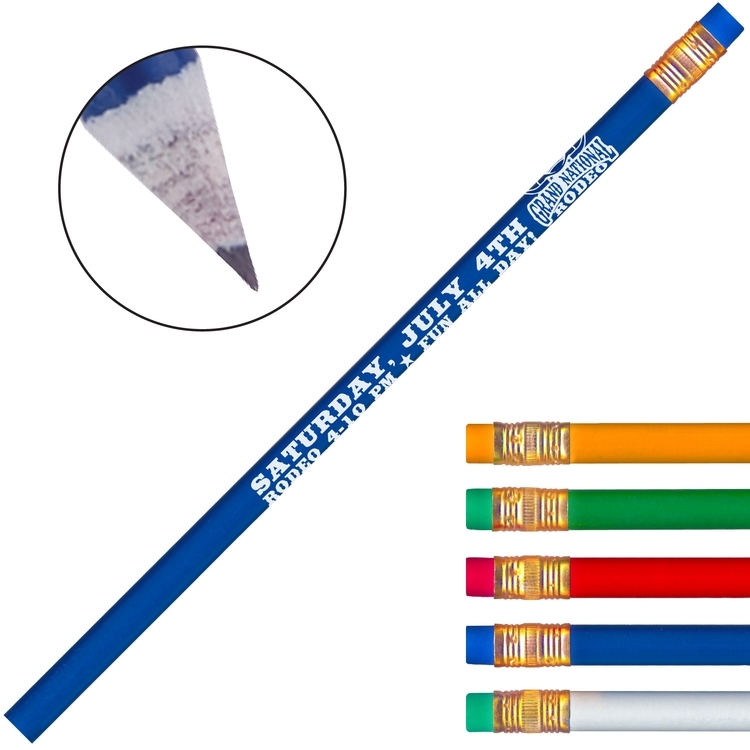 This colored crayon pencil with painted finish barrel adds impact to any advertising message! These special cores offer smooth-writing; making them ideal for use on wood; fax transmissions and classroom reports. Great for grading papers too. The standard soft colored crayon core is nontoxic and offers great versatility! Barrel color matches core color. With your custom imprint on the colorful background; they're perfect tradeshow giveaways! Colored crayon pencil with painted style barrel adds impact to advertising messages. 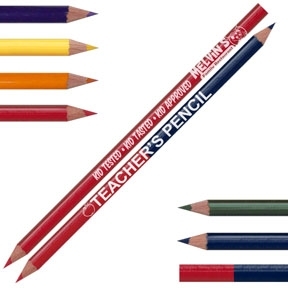 Often referred to as a teacher's grading pencil; the combination colored pencil features a red core on one end and blue on the other. With your company name or logo imprinted on the paint finished barrel the colorful design adds impact to any advertising message. The colored core is nontoxic and offers great versatility making them ideal for art studios and educational institutions. Can be packaged in heat sealed packs for fantastic fund raisers! Combination colored pencil with red core on one end and blue on the other. Looking for a promotional product that's got your name written all over it? Then you've come to the "write" place! 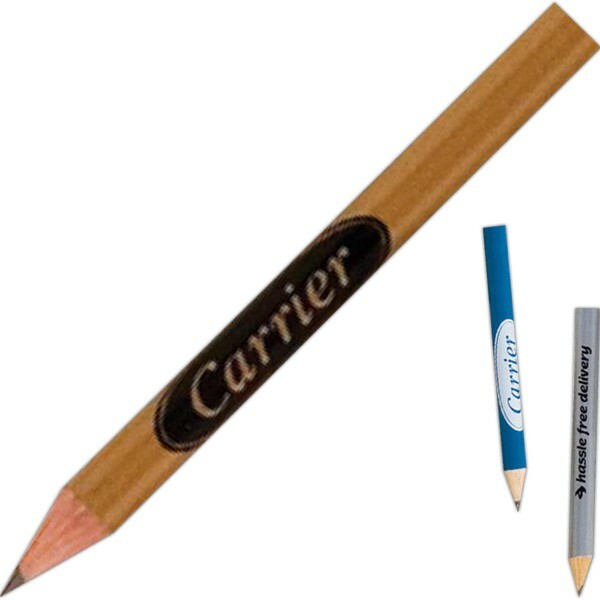 Our bonded, #2 core Universal (TM) pencil is our sales leader. This colorful writing instrument features a round, wood-cased barrel with a finished color, brass-colored ferrule and a red eraser. Choose from the variety of hot stamp foil colors. Pencil with bonded core, wood barrel, brass-colored ferrule and red eraser. 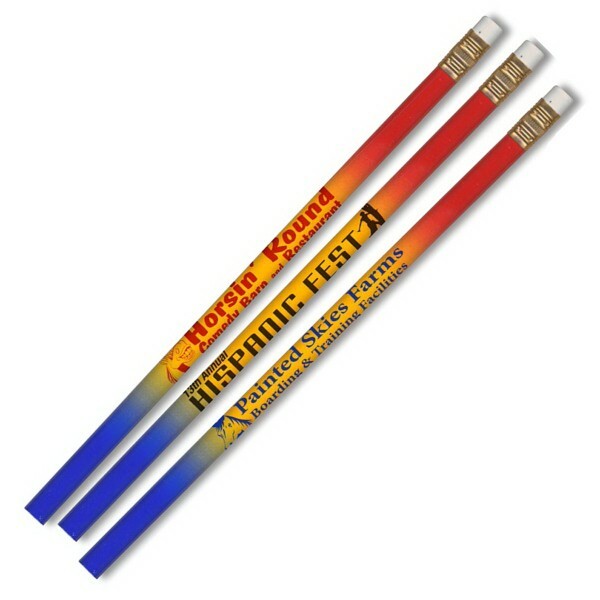 Our Patriotic (TM) Pencil is the #1 choice for celebrations, elections, community events and historic sites! The Patriotic (TM) pencil is a great way to build brand awareness! This unique writing instrument features a white, round barrel with a #2 core, brass-colored ferrule and white eraser. Add your company name or logo and hand them out on election day or at tradeshows! White round barrel #2 core pencil with red and blue stock stars and stripes design. Success can never be "foiled" when you include the Palomino pencil at your next event! Featuring an attention-getting, stunning foil finish and bonded #2 core, this wood-cased pencil appeals to happy recipients everywhere it goes. 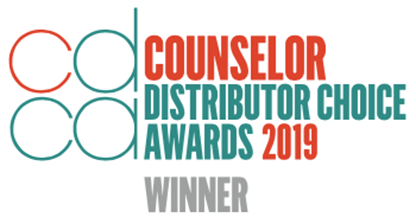 You can hand out this colorful giveaway at any conference, convention or event for memorable brand exposure. With your company's printed message, clients will never "draw" a blank on who to call!